SunStone Ships announced it has signed an agreement with China Merchants Industry Holdings to built a third Infinity-class ship. It is part of a bigger order for four expedition newbuilds with an option for six more. The Ocean Victory will be delivered in March 2021, and will be configured for 200 passengers, according to a press release. "We are pleased with the rapid adoption of the Infinity-class vessels. 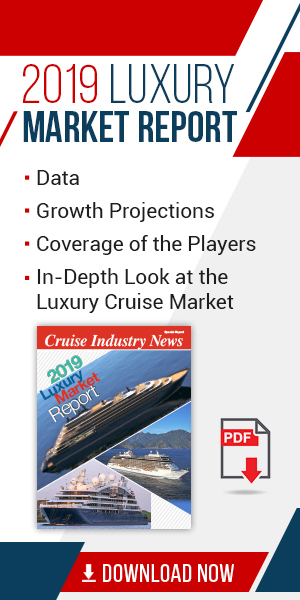 It seems our European design amd technology, combined with lower overall operating costs ticks all the boxes for the small and expedition-ship market," said Niels-Erik Lund, president and CEO. SunStone also said it has signed a long-term charter contract for the ship. The vessel will be technically managed by Cruise Management International and hotel operations will be handled by CMI Leisure. The shipbuilding contract was signed at the offices of Stephenson Harwood, SunStone’s legal advisers in connection with the Infinity Class vessels. The three day meeting in Paris included a total of 20 representatives from CMIH, China Merchants, SunStone Ships, SunStone Marine Advisors, Ulstein Design and Solution, Makinen, and Tillberg Design USA.